Penny writes plays and scripts for stage performance and animations. If you are interested in using any of the scripts, please contact Penny using the contact form. 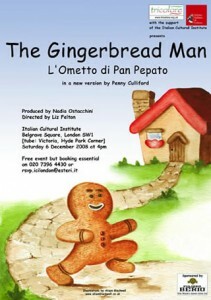 An English or English Italian bilingual retelling of the traditional tale of The Gingerbread man. A haunting tale to warm the cockles on a cold winter night. In a dark passage near the cloisters of Canterbury Cathedral, a secret lies buried for a hundred years. 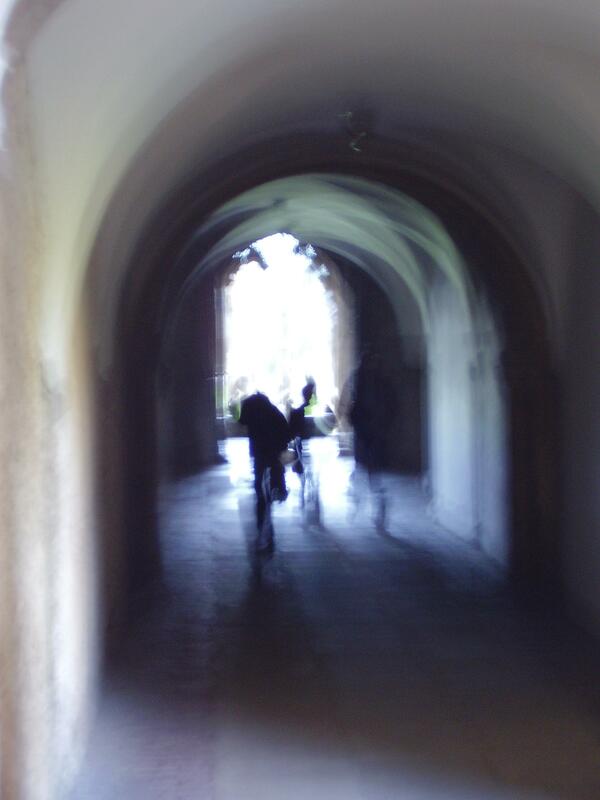 Three stonemasons arrive to work on a loose paving stone and the secret is released. A place where evil masquerades as good, and the good are driven to evil deeds but everyone gets their just “desserts”. ‘For soups, and stews, and choice ragouts, Nell Cook was famous still! 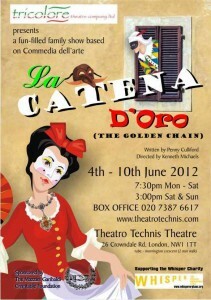 The Golden Chain (La Catena d’Oro) is a play in the commedia dell’artestyle of theatre – sounds high-brow, doesn’t it? Some people take it very seriously. 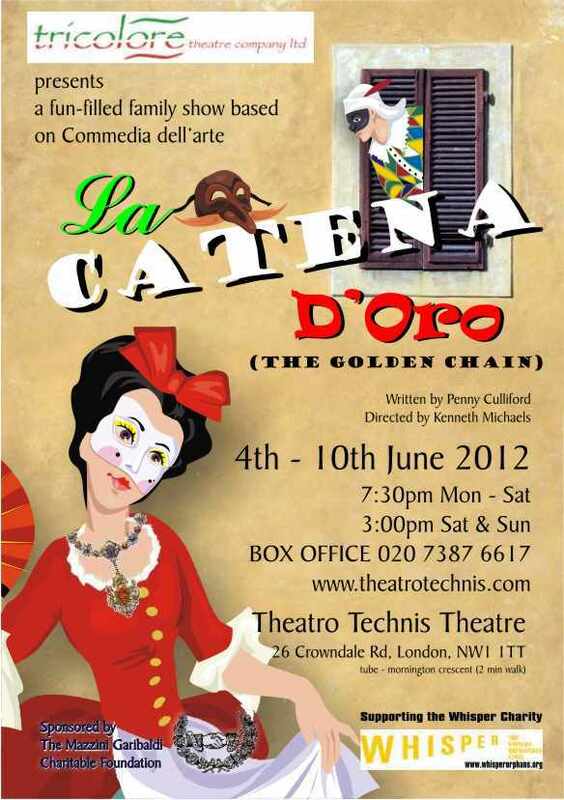 Commedia dell’arte throws together recognisable stock characters in ludicrous situations and watches as mayhem ensues. But there is always a happy ending. Without commedia, there would be no Shakespeare, pantomime,Punch and Judy, circus clowns, Charlie Chaplin or Mr Bean. Commedia is as much Del Boy falling through the bar as it is Italian Renaissancetheatre. This youtube video gives a beautiful introduction to some of the stock characters of commedia. I’ll bet there are some you recognise. Henry Hand Puppet is a brand new DVD series for toddlers created by the award winning production company Taylormation. Each DVD will contain 6, 10min episodes which will introduce the children to key Biblical stories in a fun, entertaining and creative way. Each episode follows Henry, Helen, Harriet and Fred as they spend their day together at Puppet Patch Nursery. The nursery has a large playroom and a big garden full of wonderful toys, games and activities for the puppets to keep themselves stimulated. Through interacting with the narrator the puppets learn some important life lessons like sharing, bullying is bad, respecting your friends, looking after nature and safety. These ultimately end with the narrator reading a Bible story to give an example.